The time value of money is one of the most important concepts for young investors to understand. If you've got a child/children either in college or recently graduated and they're looking to begin saving money, consider introducing them to Double Diamond Investment Group. We offer a completely FREE investment service to children of our adult clients. We'll help them by investing their money as well as educating them about the pitfalls many new investors face. What a great way to help these new savers! Contact us for details and read the compelling story below. Your kids can become millionaires before the age of 40. The key is to begin investing as early as they can. If your children start an investment program early enough, they could acquire a million dollars by the time they’re 40. Investing even with the simplest portfolio can help get them to that point. How Early Investing Builds Your Wealth. Just to illustrate the value of investing early, see these charts showing how various investors have fared over time. Invest early with less money, and you could still be ahead of those who save later. 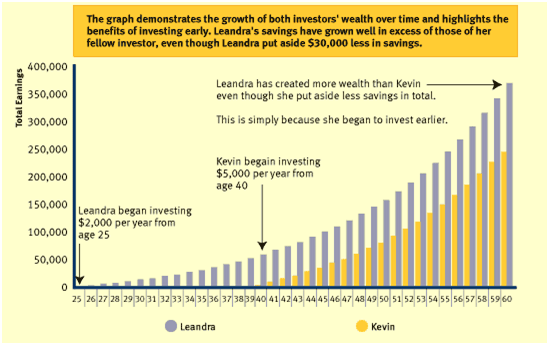 In this example, one investor starts investing early but only contributes $2,000 a year to her investments. A second investor starts much later but even with higher contributions, does not catch up to the net worth of the first investor when they reach the age of 60. The assumption is that both investors earn 8% returns every year. The only way a late starter can catch up is if he or she invests a potentially significant amount of capital at some point. Here is another chart courtesy of Motley Fool, showing that a simple lump sum investment done earlier can make quite a difference. Even if you stop contributing, you could still be ahead. It is fascinating that there are situations when “discontinued” investment programs done early in life can actually still BEAT the overall returns of someone who started much later but who continues to invest indefinitely. 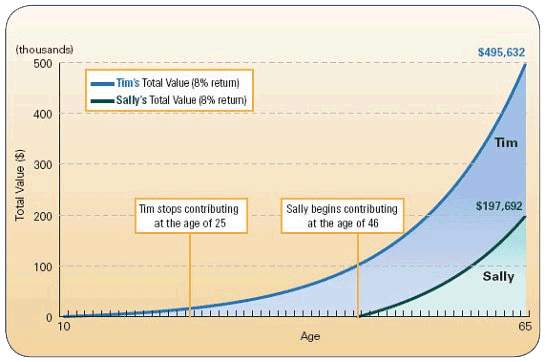 In this hypothetical example, 10-year old Tim starts putting aside $500 a year until the age of 25 and then stops making contributions. Over this time, he puts aside a total of $8,000. On the other hand, Sally doesn’t start making contributions until she is 46 and puts aside $4,000 a year until she reaches age 65. Over that time, her contributions total $80,000. In both cases, their account grows 8% a year. Despite the fact that Sally contributes 10 times as much as Tim, at age 65 her account is less than half the size of Tim’s account. 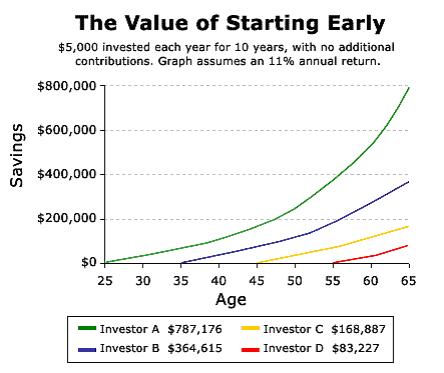 This clearly illustrates the benefit of starting early and the power of compounding. These is a great justification for children saving and investing: building a hefty portfolio by the time they are in their thirties. Granted, a million dollars in 30 or 40 years is not the same as a million dollars today, but it’s a significant sum. If your kids are earning income, they should consider opening retirement accounts. 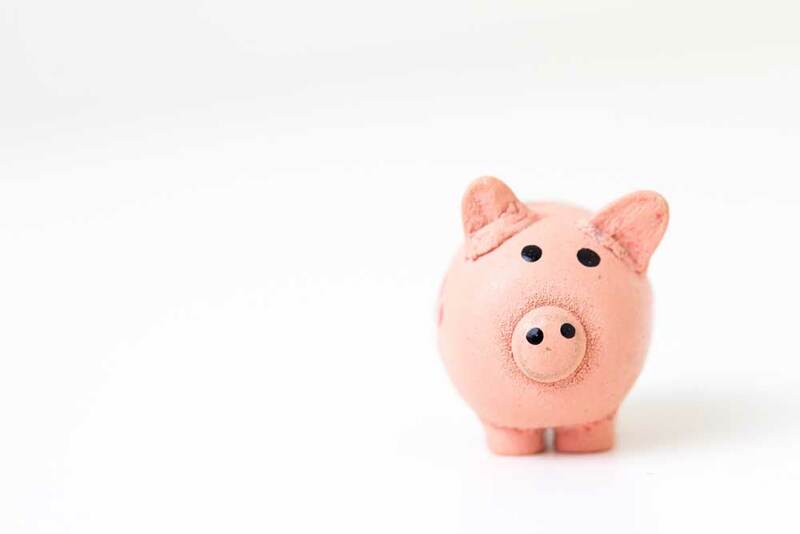 Even just $300 per month in a mutual fund can get them very far, if they set up a program to contribute this amount over 40 years (test this idea using this calculator). DOUBLE DIAMOND INVESTS FOR FAMILIES, CORPORATE EXECUTIVES, AND MID TO LARGE-SIZE CORPORATIONS. © 2019 Double Diamond Investment Group, LLC All rights reserved.